An environment references a whole environment and all it’s CloudFormation stacks. 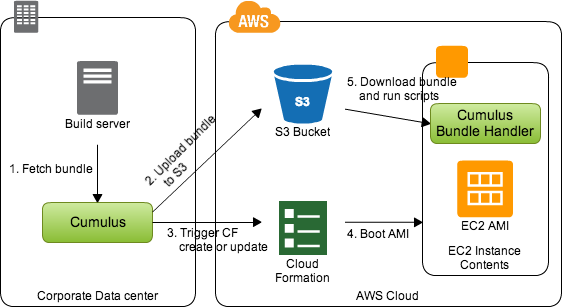 It holds together information about the AWS account, which stacks to deploy and in which version. A stack is simply a CloudFormation stack. A bundle is a .zip file with code and configuration to unpack to instances. Deployments with Cumulus can take many shapes depending on your project needs. But a common pattern can look like the example below. You can also use cumulus to build your bundle, if you don’t get a pre-packaged version of you software from the build server. cumulus can then take a certain path on the file system and convert it to a bundle. Here’s an image of an example workflow. Please note that this is a very simple example with only one server, but there are no limitations in terms of what infrastructure you could set up with Cumulus. The rest of the work is down within the AWS CloudFormation template. Please have a look at our CloudFormation template examples.